The front, rear derailleurs and shifter are Campagnolo. Crank set, hubs are Zeus. I thought the BB should be Cinelli, but no. No brand on the head set. Brakes are blue ... something. The 531 Reynolds sticker says frame, fork and stays. what do you think about the model, true or not Falcon? he is asking 200$. I passed on it. That wrap around seat stays and the fork convince me that it's a Falcon and likely a 531 Falcon. San Remo or not, I don't know. 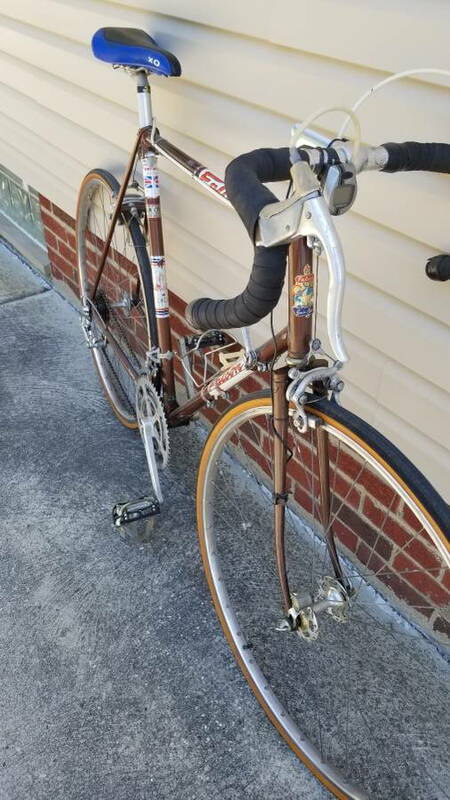 I have a Falcon that I bought new in 1975 that's 531 with the same fork and the frame looks identical except for the lugs on mine are fancier. A check of seat post diameter would tell whether it's db or not. 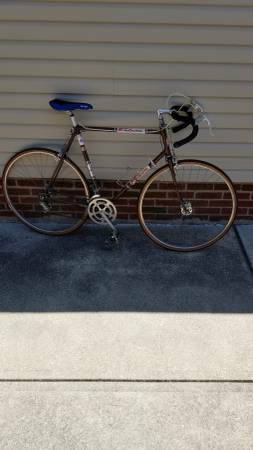 Mine had all the same decals as the San Remo except the San Remo decal on the chain stay. 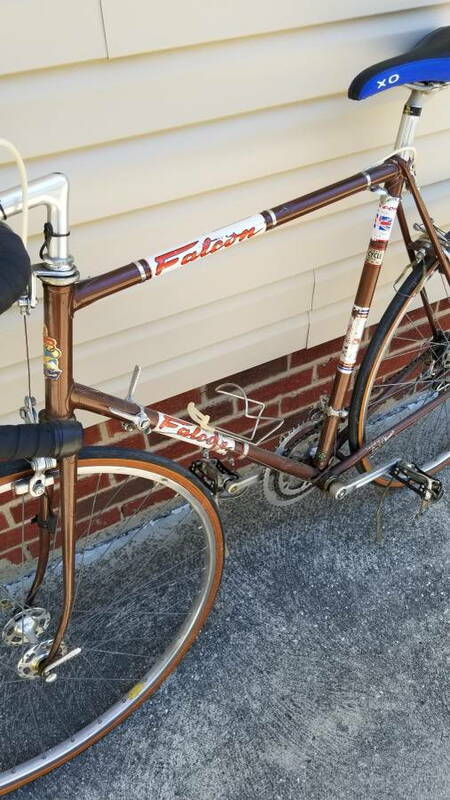 70s Falcons were, from what I can tell inconsistently equipped and even the San Remo model appeared with several different forks and not always the same lugs. One thing, all the San Remos I've seen pictures of had some chrome on the forks at least. Mine was a lot like that one in finish though it had those crazy metal foil stickers. Like that one, the stickers were everywhere. Paint looks pretty good, might not be original, but I don't know that. I had a blue San Remo, which was complete Campagnolo equipped, if I remember good. Had fancy chromed lugs too. And I think that under the paint you could see the chrome, where the paint was scrashed. This one looks like my yellow Falcon Black Diamond. I cannot compare the fork, because it was changed sometimes. I had a green Falcon with a San Remo "Designed by Ernie Clements" decal on the right seatstay. It took a 27.2 seatpost and it rode like a full 531 frameset, so I always assumed that it was. Came to me stripped with a Campagnolo headset and NO chrome. I think this one is a real Falcon and it probably rides great. It's definitely a legitimate Falcon. The San Remo name was used for about five different models. They all had Reynolds tubing but in the lowest version, it was plain gauge 531 and only in the main tubes. It's not the top San Remo but the tell tale clues as to whether this one really is full 531 with double butted main tubes would be a 27.0-27.2 seat post and a forged Campagnolo dropout with integral derailleur hanger. This looks like the three-tube plain gauge model. In OEM kitting it is roughly parallel to a Raleigh SC. Appears there be a Reynolds transfer at base of seat tube. High position for fork eyelets suggests stamped ends. Ordinary quality headset is an indicator. Note exposed threads on adjustable bottom bracket cup. Fittings may have been cobbled. Model 78 Olympic. 531 main tubes. Originally equipped with Sugino Maxy crank. Its a nice riding frame. Like the way someone has outfitted this one. I think $200 is a good deal. I never thought too much about the fork ends on mine. The rear dropouts on it are forged Campagnolo with derailleur hanger and the fork ends are Campagnolo branded, but in response to your observation, I took a look at the fork ends and, sure enough, stamped, not forged. Looks like Campagnolo 1060 Corsa -- velobase photos match my fork ends. I'm pretty sure that the frame on mine is db 531. That's what the decal said -- frame forks and stays -- and that's how it was represented to me when I bought it. Also, 27.2 mm post drops right in. I don't remember if the fork had the 531 decals or not -- first repaint was in 86. I passed on the bike too. While the seat tube moved freely, the stem was stuck. I looked at it yesterday afternoon. +1 I would have brought if my size and budget nice bike the setup this one looks great for a mid level used bike. Nice setup and good looking OG paint are huge points plus points for bike like this one . Another is this a PX10 thread! ?